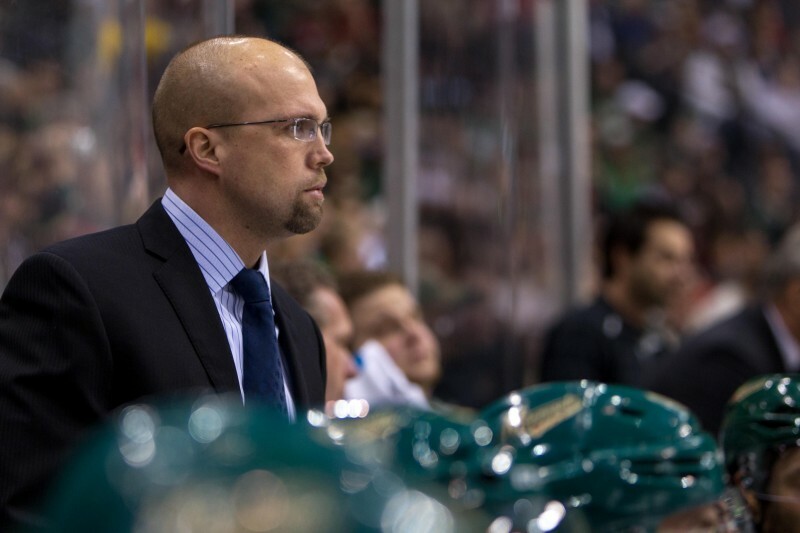 It took about 24 hours after the Wild’s Game 6 loss to Chicago for reports to begin circulating that coach Mike Yeo would be getting a prompt contract extension. Those reports are looking truer and truer as the Wild start to clear out their lockers. Yeo’s contract is up at the end of the season, along with the contracts his entire coaching staff and Assistant GM Brent Flahr. On Friday, the Wild gave Flahr a multi-year extension and made it pretty clear that Yeo would be back as well. An extension for Yeo and his staff seemed like a given for the last couple of weeks, but for most of the season it was anything but. Yeo, the youngest head coach in the NHL at 40, has always had his detractors and their chants of “Yeo Must Go” reached fever pitch in late December when the team lost six straight games and looked like a team that was not going to make the playoffs. Facing a seventh straight loss against the basement-dwelling Buffalo Sabres, it was a must-win scenario for the Wild and for Yeo, whose seat, at least in the media, was nearly engulfed in flames. The Wild won the game and proceeded to win four straight, starting off a solid January run where they went 9-4-1. Chuck Fletcher recently dismissed all the “hot seat” talk in a radio interview saying, “It’s been silly all year. He was never, ever in danger.” But it’s hard to believe that if they had lost that seventh game in a row, especially to Buffalo, that the fan uproar may have reached critical mass. The detractors still exist. Many don’t like his system or his public persona — both of which lack flash. But I’d argue that his reserved manner is part of the team’s success. Yeo never got excited about one small victory, he had his eyes on the Cup the whole time. Every post-game presser seemed to have the subtext of “a win is nice, but a single win doesn’t mean much.” There’s no magic bullet in coaching, but what he was doing was working for this team. Fans questioned calls like playing defenseman Nate Prosser over an arguably more dynamic Jonathon Blum in the playoffs, waiting as long as he did to bench Dany Heatley and Kyle Brodziak, and using Granlund on the second power play unit instead of the first — especially as the team struggled all season on the power play. During Friday’s exit interviews, Fletcher too made it pretty easy to read between the lines: Yeo is coming back. What was impressive this season was that Yeo had the team in his corner the entire season. Through ups and downs, Yeo never backed away from his way of coaching and trying to keep himself out of the spotlight. The team gelled in the postseason and seemed to believe that buying into Yeo’s system was the only way to win. Even in the moments when a coach’s decision can get hairy — benching veterans like Kyle Brodziak and Heatley — he still had the team. Brodziak and Heatley never said a word against him or his decision and they bounced back with effective games when they were allowed to re-enter the lineup. That’s a sign that a coach has the respect of his team. Yeo addresses the team and says, “Enjoy [the win] for another hour.” He never let the team lose sight of what the actual goal was, when the actual celebration could begin. And the team listened because Yeo had the locker room. The trust is all well and good, but Minnesota ownership and fans are hungry for Lord Stanley’s Cup. Yeo is conducting exit interviews and, as previously mentioned, will talk contract extensions with Fletcher in the coming week. Yeo will likely get re-signed, but after this year’s performance with a core of solid leadership and emerging talent, the expectations will be high. If Yeo cannot deliver, Leipold will find someone who can.